On October 5th the project partners gathered in Paris for their 3rd Transnational meeting. We were hosted by the Ministry of Higher Education, Research and Innovation. A report on the current progress and state of affairs was given for each intellectual output and we decided on a date for the Multiplier Event at the closing of the project. Next year on the 28th of June we will present the findings and results of 3 years work at the University of Hertfordshire, UK. It was a fruitful day and we had an interesting discussion on Privacy and Security, further discussions on the current status of the Privacy Document and on the Privacy Impact Assessment, including a presentation by a representative of Infhotep. We concluded the day with an explanation about the potential forVoice Biometrics Solutions. The 3rd Transnational was hosted by FIED on October 5th 2018 at the French Ministery of Higher Education, 25 Rue de la Montagne-Sainte-Genevieve, Paris. We meet in Schwartz room in the Foch Building. The floor plan of the ministry can be found here: Plan Ministère. A second online reach out session was held at the 20th of March at 12:30 PM Amsterdam time. 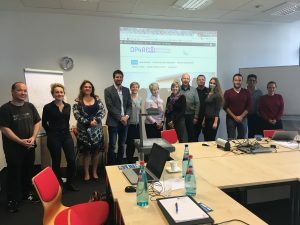 A second Transnational meeting was held on October 2nd 2017 at Wilhelm Büchner University of Applied Science. On October 2nd 2017 we organized our 2nd Transnational meeting at Wilhelm Büchner University of Applied Science (Darmstadt, Germany). It was a constructive meeting on which we discussed the past project year and our plan for the next year. In particular, we have seen that the first experiments with online proctoring were conducted with various degrees of success and that these results enable us to set-up more large scale experiments in the upcoming 2 years. On May 9th 2017 we organized our first online reach-out session. We invited our associated partners. It was a rich learning experience, both on content level as on organizational level. The technology let us down, but we’ll take this as a working point to our next reach-out session. We started with an explanation of the design of the OP4RE project and of the content of the Start Report. This report is the real “start” of our project. We were looking into the current state of affairs regarding online proctoring of remote examinations in the participating countries. From this desk research a lot of questions emerged, which we take on in the project. After this explanation of the OP4RE project coordinator Silvester Draaijer, Daniel Haven, from Proctor Exam, showed us their proctoring tool. Proctor Exam is partner the OP4RE project. Then we got an explanation of 3 partners about their first experiences with online proctoring. First Michiel van Diesen (Fontys, the Netherlands) shared his experience with online proctoring. Then Pierre Beust (FIED, France) highlighted the experiments of home proctor exams at the University of Caen. For the proctoring they use ProctorU. In year 1 (2015-2016) 55 students participated. Blended learning and home proctoring were used in addition to classical examinations. In year 2 (2016-2017) 50 students in a professional Master degree in the area of health participated. The course comprised 2 or 3 exams . They were full distance learning students, spread all over the world. Home proctoring was organized instead of classical exams. From Belgium we invited VIVES. In Belgium, they were the first (and as far as we know the only) institution for higher education, which started with the remote proctoring of exams. VIVES has a long tradition of distance learning. About 15% of the students follow a distance learning programme (on a total of approximately 13.000 students). Students in distance programmes can take their exams in the exam center in Kortrijk or online via proctoring. For the proctoring, VIVES works with ProctorExam, one of the partners of the OP4RE project. 25 and 26 October, the project management group gathers in Amsterdam at the Vrije Universiteit Amsterdam to discuss the further set-up and work break-down for the project.